Trump Orders $50 Billion In Trade Tariffs On China - Joe.My.God. 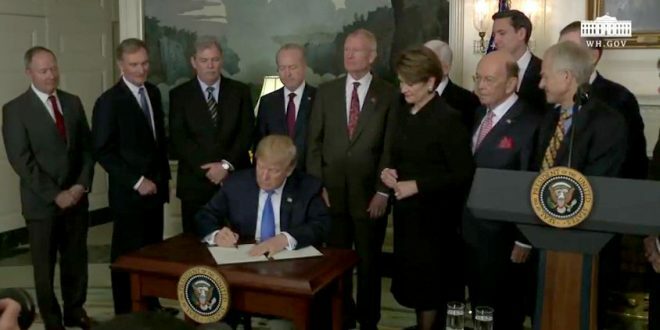 Trump signed a presidential memorandum Thursday directing his trade representative to draw up a long list of Chinese products to which the tariffs would be applied. The list will be made public in 15 days, and the tariffs would take effect after a period of public comment. The president suggested the total value of the tariffs could go as high as $60 billion. Stocks fell sharply Thursday, March 22, as investors braced for the fallout from $50 billion in tariffs targeted toward China as Donald Trump vowed to lower the U.S. trade deficit with the world’s second-largest economy. Trump announced the new tariffs, which will largely impact consumer technology goods, as part of his broader effort to both trim China’s $375 billion trade surplus and punish the nation for alleged intellectual property violations.